Reversing its previous announcement, CBS has said it will continue to use Walter Cronkite’s voiceover on the opening sequence of the “CBS Evening News,” according to the New York Times. After Cronkite’s death Friday morning, anchor Katie Couric had indicated his voice would be used just one more time — on that evening’s edition of the broadcast. Network officials backed her up and Saturday’s edition of the newscast featured a generic announcer. Apparently, however, network executives had a chance to confer with Cronkite’s family who indicated they would “consider it an honor” in the network continued to use his voice. Cronkite’s voice debuted with Couric’s first evening on Sept. 5, 2006 after some speculation regarding its use. The show was making use of his voice during rehearsals but prior to Couric’s debut there had been no official decision. At the time, there was also some discussion about the fact that Cronkite pronounced Couric’s last name slightly differently than she normally does. While CBS’s original reaction to pull Cronkite’s voice was certainly understandable, it is nice to hear they’ve decided to keep the same voiceover. 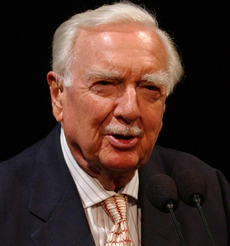 Though the CBS Evening News has fallen significantly since Cronkite’s days at the healm, he did have such a significant impact on the program. 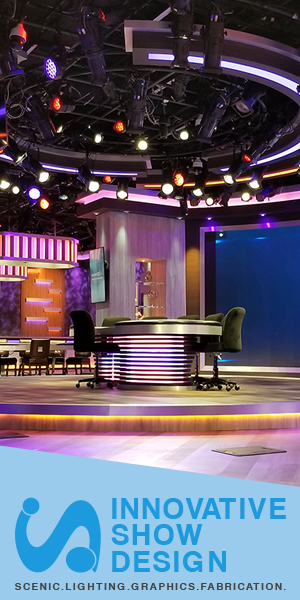 It’s a similar approach to how “NBC Nightly News” previously featured the voices of its previous anchors in the very beginning of its teases and not only honors the people who built the newscast but also gives viewers a sense of the storied nature of many of these programs. NBC has since done away with the audio clips but still features portraits as a design element in many of its graphics. There is also a backlit graphic, rarely used weeknight editions, that features both past anchor photos and previous NBC logos.